Jiu-jitsu.News: Ukrainian fighters have demonstrated an excellent fight in Berlin! Ukrainian fighters have demonstrated an excellent fight in Berlin! Berlin welcomed the “German National IBJJF Jiu-Jitsu Championship 2017”. Ukrainian fighters could not miss such sport event. 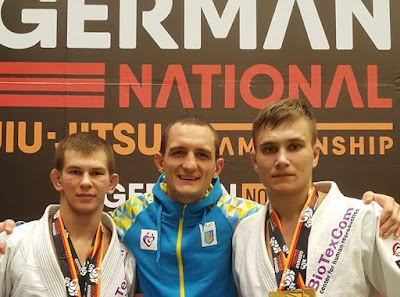 Jiu-jitsu championship that took place at Berlin “Sporthalle Haemmerlingstrasse” sport arena turned out to be interesting and rather intense for Ukrainian athletes. “Fights in absolute weight categories were especially useful for us”, – said coach of the SC “Borets” Ievgen Skyrda. Nepota Roman had 7 fights – 5 of them he won by technical superiority and in 2 fights Roman received confident victory in points. “Needed rework will be done, and first of all it concerns an approach to the tactical plan”, shared Ievgen Skyrda. It is to be recalled that the “German National IBJJF Jiu-Jitsu Championship” is open for fighters from all over the world, of all categories.